You'd think with the excitement of Christmas, kids home and all, I'd be bubbling with writing ideas. Not. All writers face this. I read somewhere that writers shouldn't give in to "writers block." We don't write only when we feel like writing, we write no matter what. Even when there's nothing to say, we write something. And hopefully the ideas start flowing again. So. My son David, who's home for the week, mentioned, "no blogging lately, mom." So here you go, reading the nothing that I have to say. Christmas was nice. (I try not to use that word, thanks to my 8th grade English teacher Mr. Stanko.) But Bill's mom was under the weather and didn't join us. Dan and Jenny weren't here. So it seemed low-key. We watched Mamma Mia, the DVD Katie gave us. Fun all over again. The boys weren't too excited. We've brewed a lot of coffee and eaten too many peanut blossom cookies. My friend Beth called for my cornbread dressing recipe. On Christmas morning!? I love her! We've played a few games. I cannot beat David in speed Scrabble. Darn. In a salute to the new year, I'm cleaning up my study. This exercise seems to need repeating about every 3 months, so I get pretty discouraged. We've shopped a little and today saw the movie, Slumdog Millionaire. I don't know how my son talked me into an R-rated movie, and it was scary for this old bird. It was his early treat for all our January/February birthdays. I liked it but hope I don't have nightmares. To top off the evening, David kindly pointed out that in one year I'll get the senior rate at the movies. whoopee! Writers block is a bummer. But I press on. Sons seem to come roaring into the world. They're loud. They tease. They burp. They play mean tricks on their sisters. They attract dirt and hate baths. Before I had kids, I was really a little scared about having even one little boy. I wasn't sure about raising one. God laughed and gave me three boys, one right after the other. I nicknamed them Curly, Larry and Moe. You figure it out. Our boys won my heart in short order. Bringing me fresh-picked dandelions. Asking me to play trucks or color with them. Writing me little love-notes. "Fixing" things around the house. Holding my face and declaring their love for me. Snuggling on my lap for a story at bedtime. And when they did bathe, they were just so handsome with their wet hair neatly combed. In contrast to girls, boys put it all out there with no pretending. They tell it like it is. Or they slug their brothers and then everything's good. Like the men they're destined to be, boys get to the task at hand and it's done. They love a challenge and chores can be accomplished by making them into a race. Although they sometimes tried to hide the fact, my boys had tender and compassionate hearts. Would I ever sacrifice my sons? I mean give them up in a life or death situation? I don't know of a mother who would. Not for a good person and certainly not for an evil one. There's not anything or anyone in this world that could convince me to give up one of my sons. But God took no convincing. He saw the mess we'd made in this world and devised a plan to save us. Unbelievably, God became man in the form of a tiny baby and was entrusted to a young Jewish couple 2,000 years ago. Unlike the nativity sitting on our piano, God knew his son wouldn't stay in the manger. He'd grow up and in obedience to his father, die a horrible death on a cross for the sins of everyone, for all time. My father was born 84 years ago today in Luxora, Arkansas. He also graduated from the University of Arkansas, making him a "razorback." It's a type of pig and on Saturday afternoons when Arkansas football was on TV, I'd hear dad bellow, "oooooo, PIG, soooooowweeeee!" from the family room. It was his Arkansas cheer and very uncharacteristic of my staid father. A son of the Depression, my dad's childhood taught him the value of hard work and contentment. These days, those seem to be fading character qualities. I wish I could spend the day with dad. I know as a boy, his birthday was overshadowed by Christmas. So officially, all the Christmas trappings aside, I wish him a very special and happy day! As my dear hubby read the last post, he commented on "Poppy's PEE-cans." The pronunciation of this sweet little nut has been a source of disagreement in our marriage from the beginning. The source of pecans is the south. And people in the south say pi-CAHNS. Not PIE or PEE, but a soft PI, almost a PUH. Got it? Unbelievably, years ago I heard yet another pronunciation. Some Spanish-speaking natives pronounce pecan to rhyme with rican, as in Puerto Rican. I can almost accept that. If I need official back-up on this (which I do not), Webster's gives the pronunciation of pecan as pi-CÄN ... not PEE-can. And defines it as "a large tree of the central and southern United States with an edible oval, thin-shelled nut." How can this be more obvious? If pecans grow in the south, then southerners should dictate how to pronounce their nut. And to my ear, there should be no pee in pecan. Please. Nice and gentle, now: pi-CAHN. There. Isn't that better? In the year I was born, 1955, my mother's parents bought a 2-bedroom house on an averaged-sized lot in Memphis, Tennessee. It was their pride and joy, but when I study photos taken during that time, I am startled by the sparse, scrubby lot that later became their lush yard. "Poppy and Dorothy" produced all sorts of home-raised goodies: apples and applesauce, grape preserves, tomatoes, legendarily-hot peppers, and pecans. This wouldn't be so remarkable except for the fact that they lived in the city. You'd think they had acres of land. During the years we lived in New England, my mother squealed when the box arrived in December from her father in Memphis. She knew that it held the perfect pecans from his own trees in the backyard. Not only did he harvest them, he must have spent hours shelling them because we only received the nut meats. They were plump and sweet and divine. I miss Poppy. And I miss his pecans. Our annual Christmas letter is now in production. It's always a time-intensive labor of love. I dive in every December and by this point, always wonder why I didn't start back in August. sigh. It's going slowly, but with fingers to the keyboard and brain in gear, the letter will happen. Meanwhile, this blog will take a rest. Listen up, Yankees. Yesterday I made a favorite childhood holiday food, CORNBREAD DRESSING. It was always called dressing and never stuffed into a turkey. In fact, I probably never saw a stuffed turkey until I grew up. And the gummy globby stuff that comes out of turkeys just doesn't please my palate. I realize there are countless versions of dressings and stuffings and my daughter-in-love Jenny made a very tasty one over Thanksgiving. Not the cake-like fascimile from a Jiffy box, noooooo! Southern cornbread is best made with stone-ground cornmeal, a very little flour, egg, salt, baking soda & powder and buttermilk. Note: No sugar! After a good mixing, the batter is turned into a piping hot iron skillet laced with a little bacon grease. It SIZZLES as it's poured into the skillet and popped into a hot oven. The dressing is then made with the crumbled cornbread, some dried white bread, a beaten egg, boiled onions & celery and so much chicken broth that the dressing resembles a floating peat bog. (My staid grandfather insisted that an egg would ruin the family dressing, however my independent-minded grandmother always put one in. I thought that was very funny.) Bake and serve. Last night we witnessed a peculiar thing called Silent Night. 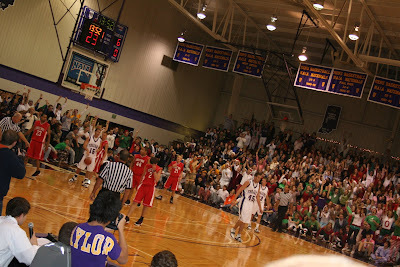 It's an annual basketball game held the first Friday of December at Taylor University. The enormous crowd remains silent for the first nine points scored. At the tenth point, the crowd erupts into a wild frenzy. The students wore pajamas, Santa hats and elf slippers. Even the university's president strolled through in a bathrobe, greeting students and visitors. Rival residence halls chanted out to each other and my sons' former dorm, Sammy Morris, serenaded us with Christmas carols from the end zone. Following the game, the crowd of students met up at the dining commons for "Habecker's Holipalooza" - a festive Christmas celebration of cookie-decorating, hearing the Christmas story from President Habecker and other fun events. Of course, we had a bit of our own fun at Ivanhoe's, the famous local restaurant. Several parents who'd gone to Ireland enjoyed Ivanhoe's burgers and sundaes. Special thanks to the RODMAN FAMILY who live in Upland. We spent some time together and had good laughs over Kelsie's pizza dough, which was mysteriously missing the yeast. The warm fellowship with them made it all ok. Thanks, Kelsie & Rob, Ellie, Jessi and David! 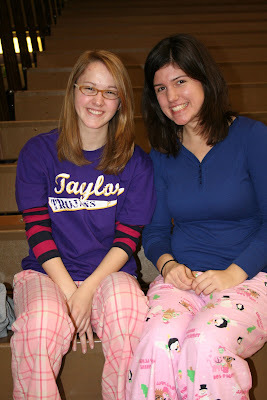 Katie and her good friend, Christy, enjoying Silent Night. 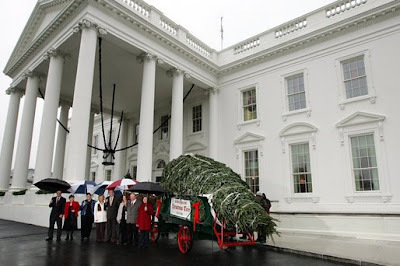 The White House Christmas tree arrived from North Carolina over the weekend. The towering Fraser fir now stands in the blue room, fabulously adorned in this year's red, white and blue theme. This week, First Lady Laura Bush gave the media a tour of the White House all decorated for Christmas. sigh. Do you know how much I've wanted to visit the White House for most of my life? Oh, I've seen the outside a few times. But I may as well be looking at a photograph. I really, really want to get inside and wander those amazing bedrooms, ballrooms, offices and halls...where Lincoln, Roosevelt and Reagan walked. I don't know what it is. Maybe a psychologist could explain, but - I'm not making this up - I've dreamed about being in the White House and talking with the President. While in college, I dreamed that Jimmy Carter and I chatted over coffee in the White House kitchen. I certainly have no political or presidential aspirations, but I sure would like to spend a few hours in the "people's house." You might find this trivial and ridiculous. But it’s on my mind today and silly memories have a way being forgotten. A writer can't afford that. My kids reading this will be, I'm pretty sure, mildly horrified. Or revolted. Is that a word? Not that I would DO this thing, but that I'd share it publicly. One of the pluses of an empty nest is the freedom to run around in my underwear. Inside the house. I promise, I have never run outside for the newspaper in my underwear. I wouldn't do that to my neighbors. It’s a liberating dash, performing these tasks in such a state, or simply leaving the bedroom door open with no worry of a nearly-grown son lumbering through. My daughter's home now, but even she admonishes, "gosh, mom!" if we meet unexpectedly in the hall. No photos today. You understand.